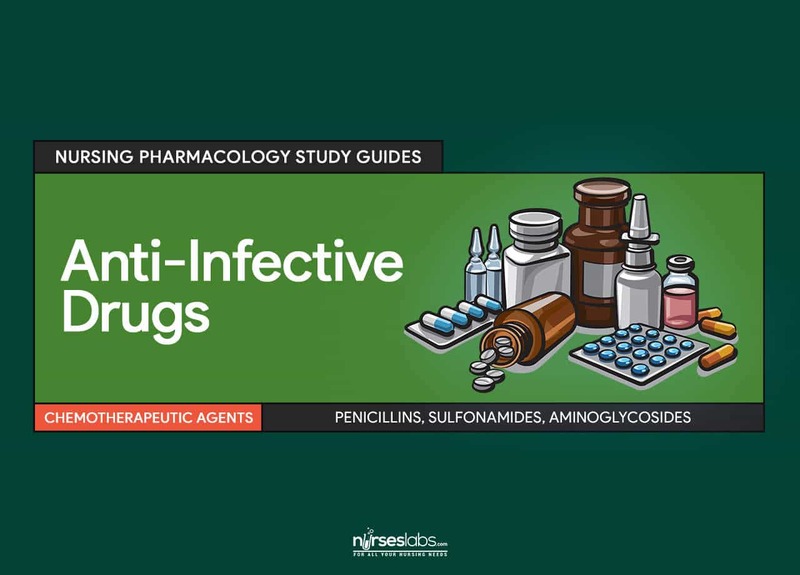 Anti-infective agents are drugs utilized to exert effect on invading foreign organisms on the body, especially those which can cause infection. Its scientific investigation started in the 1920s after Paul Ehrlich developed synthetic chemicals that would be effective only against the certain proteins or enzyme systems used only by infecting organism and not by human cells. Drug resistance remains to be the major challenge in the use of anti-infectives against infections. Emergent strains are rapidly adapting to repel the effects of anti-infectives. Anti-infective agents act on invading organisms in several different ways as mentioned above. The goal of therapy is interference with the normal function of the invading organisms to prevent them from reproducing and thereby causing cell death. Narrow-spectrum anti-infectives are agents that are so selective in their action that they are effective against only a few microorganisms. Broad-spectrum anti-infectives are agents that interfere with biochemical reactions in many different kinds of microorganisms. Anti-infectives that can cause cell death are said to have bactericidal effects. Anti-infectives that can interfere with the ability of the cells to reproduce or divide are said to have bacteriostatic effects. Over time, invading pathogens develop resistance to anti-infectives. Enzyme production. Strains of bacteria that were once susceptible to penicillin can now produce an enzyme called penicillinase which inactivates penicillins before they can exert their effect to the bacteria. Cell membrane permeability alteration. This prevents the drug from entering the cell. Some bacteria alter transport systems to prevent the drug from being transported actively into the cell. Binding site alteration. Prevents the drug from being accepted into the cell. Chemical production. Acts as antagonist to the drug. Vancomycin (Vancocin, Vancoled) is an antibiotic that interferes with cell wall synthesis in susceptible bacteria. This was developed as a result of a need for a drug that could be used for patients who are allergic to penicillin and cephalosporins as well as in treatment of patients who have staphylococcal infections resistant to penicillins and/or cephalosporins. It is highly-toxic that it is reserved only for certain situations as it can cause renal failure, ototoxicity, superinfections, and red man syndrome (sudden and severe hypotension, fever, chills, paresthesias, and erythema or redness of the neck and back). Drug dosing. The nurse may collaborate with the physician for around-the-clock dosing to eliminate the peaks and valleys in drug concentration. This also helps maintain a constant therapeutic level to prevent the emergence of resistant microbes during times of low concentration. Drug duration. The nurse should emphasized the importance of finishing the prescribed duration (correct number of times each day for the full number of days) of anti-infective therapy to ensure that microbes are completely eliminated and are not given the chance to grow and develop resistant strains. Use with caution as early exposure can lead to early sensitivity. Use of antibiotics in pediatric ear infections (which might be a viral infection) may contribute to development of drug resistance. Children are susceptible to gastrointestinal (GI) and nervous system effects of anti-infectives so it is important to monitor their hydration and nutritional status carefully. This age group tend to demand for quick cure to various signs and symptoms. Therefore, drug allergies and emergence of resistant strains can be a big problem with this group. Extra caution is exercised in pregnant and lactating women because many of these agents have teratogenic effects to the fetus and can cross into breast milk. They present with manifestations that are different than younger age groups so culture and sensitivity tests are important to determine the type and extent of infection. They are susceptible to severe GI, renal, and neurological effects and must be monitored for nutritional status and hydration during drug therapy. Their liver function should always be taken in consideration when planning for anti-infective therapy. Kidney damage. Drugs like aminoglycosides have direct toxic effect on the fragile cells in the kidney and can cause conditions ranging from renal dysfunction to full-blown renal failure. Patients should be kept well-hydrate throughout drug therapy course to facilitate drug excretion. GI toxicity. Many anti-infectives have direct toxic effects on the cells lining the GIT causing nausea, vomiting, stomach upset, and diarrhea. Some drugs have toxic effects on the liver causing hepatitis and even liver failure. Neurotoxicity. Some anti-infectives can damage or interfere with the function of nerve tissue, usually in areas where drugs tend to accumulate in high concentrations. For example, aminoglycoside antibiotics collect in the 8th cranial nerve and can cause dizziness, vertigo, and loss of hearing. Chloroquine, a drug for treatment of malaria can accumulate in the retina and optic nerve and cause blindness. Hypersensitivity Reactions. Most agents are protein bound for transfer through the cardiovascular system and are able to induce antibody formation in susceptible people. With next exposure, immediate or delayed allergic responses may occur. Superinfections. Broad-spectrum anti-infectives can destroy normal flora. Superinfections are infections that occur when opportunistic pathogens that were kept in check by normal flora bacteria have the opportunity to invade tissues. Common causes of superinfections are Proteus and Pseudomonas. This antibiotic can have an adverse effect of dizziness, vertigo, and loss of hearing. This antibiotic collect in the 8th cranial nerve causing neurotoxicity as manifested by dizziness, vertigo, and loss of hearing. This anti-infective agent exerts its effect by interfering with steps in protein synthesis. Options B, C, and D exert their effect by depriving the invading organisms of the essential substances they need for cell division or reproduction. A 60 year old male patient on fourth day of his antibiotic therapy complains of dizziness and nausea. Which is the most appropriate nursing action? Institute safety precaution and raise side rails. Collaborate with the doctor about antibiotic therapy’s dosage and duration. Instruct client to inform you if symptoms get worse. All other options are correct but it is best to address the main cause of the patient’s manifestations. Elderly patients are more sensitive to neurologic and GI adverse effects of drugs. It occurs when the cells of the invading pathogens no longer respond to the drug. A middle-aged woman came to the ER and complains of ringing in the ears, paresthesias of the extremities, and erythema of the back. She also noticed that she had decreased urine output. What history of drug intake should the nurse ask? Its toxicity includes ototoxicity, renal failure, and red man syndrome characterized by erythema on the neck and back, paresthesia, chills, severe hypotension, and fever. 1. This antibiotic can have an adverse effect of dizziness, vertigo, and loss of hearing. 2. This anti-infective agent exerts its effect by interfering with steps in protein synthesis. 3. A 60 year old male patient on fourth day of his antibiotic therapy complains of dizziness and nausea. Which is the most appropriate nursing action? A. Institute safety precaution and raise side rails. B. Collaborate with the doctor about antibiotic therapy’s dosage and duration. D. Instruct client to inform you if symptoms get worse. 3. Answer: B. Collaborate with the doctor about antibiotic therapy’s dosage and duration. 5. A middle-aged woman came to the ER and complains of ringing in the ears, paresthesias of the extremities, and erythema of the back. She also noticed that she had decreased urine output. What history of drug intake should the nurse ask?